Return to the House of 1,000 Doors to save mankind from annihilation! Giant snakes have burst out of the Earth and are wreaking destruction across every continent. From the smoking rubble of a ruined city, the House rises to the clouds, and a mysterious stranger rescues Kate from certain death and brings her to the strange dwelling. Her mission: to travel back in time to four different epochs to gather the elements needed to activate a machine that can destroy the ancient beasts.Your journey as you guide Kate will challenge you. As you scour each jaw-dropping location for the items you need, you will face a terrifying serpent god, save a medieval girl from a mad inquisitor, and stop the plans of an evil Roman emperor. You'll also search for hidden objects, solve mind-bending puzzles, and beat clever mini-games as a story of remarkable imagination unfolds with each step forward. The House serves as a portal to many adventures - and this is one of its greatest. 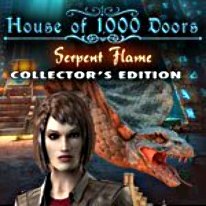 Do you have the courage to step through the door?The Collector's Edition of House of 1,000 Doors: Serpent Flame features a thrilling bonus chapter, desktop wallpapers, concept art, and a step-by-step walkthrough. - 60 locations, 37 mini-games, and 15 hidden object scenes! - View video, replay mini-games, listen and save music.